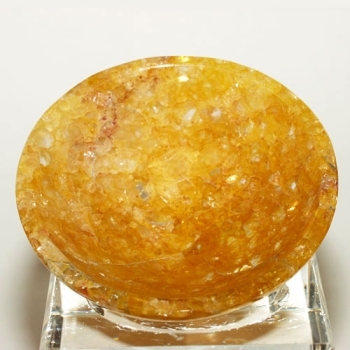 Dimensions (HxWxD): 0.85" x 2.15" x 0.75"
These gorgeous sparkling Golden Healer Quartz Bowls are cut & polished and have a lovely translucence and emanate a soft golden orange glow. The average size is a diameter of two inches, reaching a height of approximately one inch, so it is large enough to hold a small flower or simply water and can be placed on your altar or a display shelf or window sill in your home. Each piece will differ slightly from the appearance here as each one is hand cut, and each one is beautiful and guaranteed to meet with your satisfaction. Another wonderful use to which we put these treasures, is to use them to make gem elixirs, either in the morning dawn, infused in moonlight or even in the sun, depending on the purpose to which you are putting the elixir. Golden Healers are wonderful stones to use in any kind of healing work. They emanate the golden ray which resonates with the Crown Chakra as well as the Solar Plexus. Therefore they are useful in disorders of the mind, the spirit & digestion. They can be used to facilitate healing on all levels and of course, they also heal through their beautiful ray alone. Check out the article Using Quartz Crystals in Digital Technology, Healing and Meditation for an overview of the metaphysical and mineralogical properties of quartz, and a step-by-step guide explaining how to cleanse, charge, and program quartz crystals for healing, meditation and other spiritual purposes. Note: Each piece is unique & therefore may vary somewhat from appearance & dimensions. Each piece is guaranteed to be beautiful & to meet with your complete satisfaction! Average weight is 23-25 grams.